"Sampath Speaking" - the thoughts of an Insurer from Thiruvallikkeni: Madras High Court suggests revisit of Borstal Schools Act ~ why Alan Knott here !! Madras High Court suggests revisit of Borstal Schools Act ~ why Alan Knott here !! Remember well that Chepauk Test in Jan 1977 – Tony Greig captained England to a great 200 win in a series otherwise marred by the ‘vaseline incident’ of John Lever. At Chepauk, it was the 3rd Test of the Series – Indians responding to 262 were shot out for 164 ~ RGD Willis ran in fast, long and furious and it was a sight to look at – there was Chris Old and the wily Derek Underwood but it was the left handed John Lever who took a 5 for … In their second innings England declared at 185 for 9; with Chandra taking 5 and Prasanna 4. Set to score 284, India gave a pathetic display getting dismissed for a paltry 83. RGD Willis took 3; John Lever 2 and Underwood 4. There was the mercurial Alan Knott who jumped and pouched with aplomb and swept with equal ease. 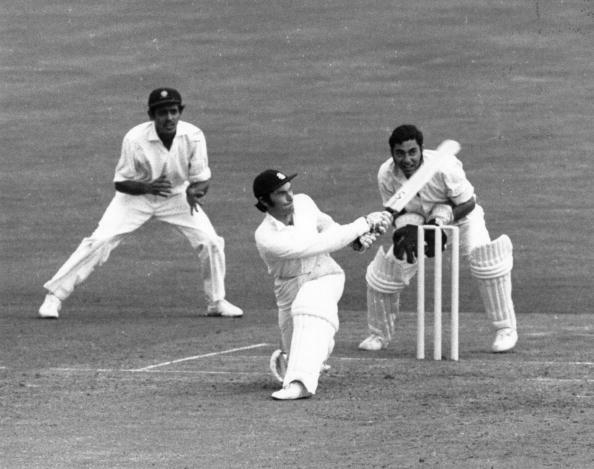 Pic credit : sportskeeda.com : Alan Knott sweeps, Farokh Engineer, keeps and Venkat Raghavan seen. Alan Knott and Derek Underwood hailed from Kent; there are others like Colin Cowdrey too. Kent has produced some notable wicket-keepers Les Ames, Godfrey Evans, Alan Knott, Geraint Jones – Rahul Dravid played one season for Kent, so did Arvinda de Silva and MuttiahMuralitharan. As I had written earlier, my limited knowledge links to Cricket and Kent is a county playing Cricket. Geographically, read that is borders Greater London, Surrey, Sussex and Essex !Canterbury Cathedral in Kent has been the seat of the Archbishop of Canterbury, leader of the Church of England, since the conversion of England to Christianity by Saint Augustine in the 6th century. More than Cricket and more than Kent, this post is about an Act that differentiates criminal acts and its punishments based on their age. Borstal is a place in the unitary authority of Medway in South East England. Originally a village near Rochester, it has become absorbed by the expansion of Rochester. The youth prison at Borstal gave its name to the Borstal reform school system. Its name came from Anglo-Saxon burg-steall "fort site" or "place of refuge” – reportedly the village is mentioned in the Domesday Book of 1086 as Borchetelle, and then consisted of a 50-acre meadow, six households and two watermills.A borstal was a type of youth detention centre in the United Kingdom and the Commonwealth. In India, it is known as a borstal school.Borstals were run by HM Prison Service and intended to reform seriously delinquent young people. The court sentence was officially called "borstal training". In UK, Borstals were originally for offenders under 21, but in the 1930s the age was increased to under 23. The Criminal Justice Act 1982 abolished the borstal system in the UK, introducing youth custody centres instead.In India, borstal schools are used for the imprisonment of minors. Now there is much heat stating that Borstal school concept has outlived its purpose and it suggested to the state government to consider repealing it. The Madras High Court on Wednesday quashed a Tamil Nadu government order declaring all the sub-jails in the state as borstal schools and suggested it to repeal the Tamil Nadu Borstal Schools Act, 1925, saying it has outlived its purpose.A five-member special bench comprising Justices ASelvam, M Sathyanarayanan, B Rajendran, R Mala, and N Prakash, quashed the Tamil Nadu government order passed on August 12, 2008. Borstal school is a special institution, in which adolescent offenders aged between 18 and 21 are lodged and given industrial training and other instructions.The special bench was constituted to answer several legal questions such as whether the Act casts a duty upon the court to examine if an adolescent convict would be entitled to the benefits of the law and would the failure of the court to examine this aspect at the time of conviction and sentence, give a vested right to the offender to claim the benefits retrospectively, even after crossing the age of 21. The bench said the borstal school concept has outlived its purpose and it suggested to the state government to consider repealing it. Sections 8 and 11 of the Act do not cast a duty upon the court to examine whether an adolescent offender would be entitled to the benefit of the Act and it is for the offender to avail the privilege after his conviction and before the passing of sentence, it held.However, the convicted person does not have a vested right to claim the benefits of the Act after crossing the age of 21 years, it further said. It was open to the magistrates to remand the accused between the age group of 18 and 21 to prisons and not to borstal schools, the bench said. Holding that the Borstal Schools Act has become outdated, as it was enacted in 1925 and it does not serve the purpose any more, Madras High Court has suggested to the State government to revisit the Act. The specially constituted five-judge bench, which made the recommendation on August 29, also quashed a GO declaring all the sub-jails in the State as Borstal schools.It also overruled the judgment of a Full Bench of this High Court holding that the word ‘imprisonment’ in Section 8 of the Act included “imprisonment for life,” as it did not lay down the correct position in law and suggested to the government to repeal the entire Act since it has outlived its purpose. Not many have forgotten and still repent and feel sense of injustice over the sordid episode of a sentence that seems horribly inadequate for a devious crime. Nirbhaya would never be forgotten when thugs on a cold December night gang-raped and brutalized, an innocent 23-year-old woman and threw her out of a moving bus to die. One of them walked out being a juvenile though having committed a heinous crime. Nation overwhelming felt that a loophole in our legal system allowed the perpetrator of a heinous crime to escape. As if the sense of injustice wasn’t enough, the Delhi government announced a rehabilitation plan for the convict that provided financial grant along with a sewing machine, rental space for a tailoring shop and ancillary help to sustain his business for a period of six months !